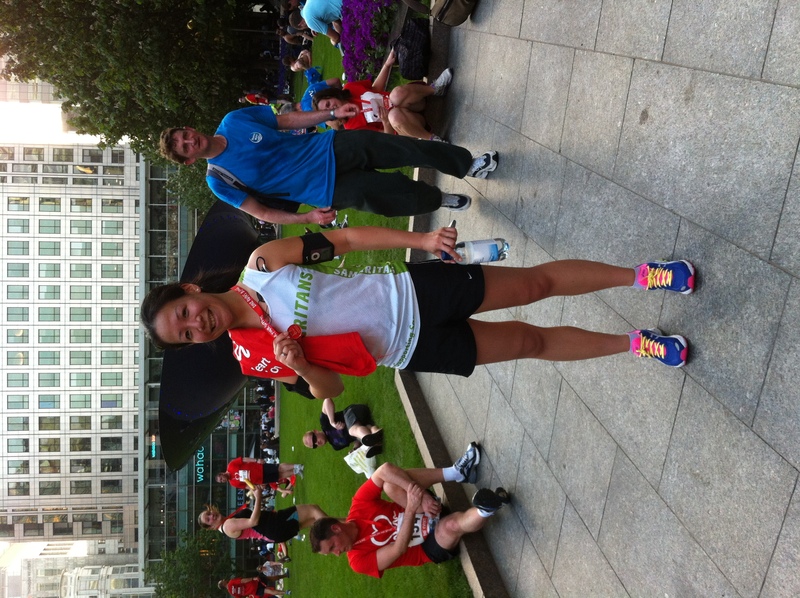 Famous British Heart Foundation Canary Wharf Jog. A free event, in the heart of docklands which you can run as many laps as you like up to 10km. Hugely popular and unique street jog around the famous towers of Canary Wharf is great way to end the working day. RACE DAY – Sitting up resting new injury. Groan. Not good that I am in pain trying to sit on my sofa. Hips. What on earth! Exactly. Never experienced hip joint pain before. Started aching at 2k, and then at 5k it was killing me. A very hot 26 degree day, I was prepared, by rehydrating before and during, so I know it’s not that. My friend JY was very concerned and urged me to must go see a physio. I struggled to walk home and simply get up from a seated position. Baring it after the 2k, I naturally assumed it would go away, but it only got worse. Many people there. In the BHF red tees. So many out, after work. Fab turn out and everyone did they bit of fitness, regardless if they ran, jogged or walked. Congrats to everyone. Even a little tiny girl waddled her way round. 1k Laps around was dull, and sun was beaming down on everyone. It certainly pulled the support and crowds in. There were cheerleader children with pom poms, with over excited warm up. The down side was that part way round the lap, you wind through the edge of the water, but because of the fabulous weather we were experiencing, workers were outside drinking, which clogged up the path, causing everyone to halt mid route each time we got there, and had traffic and congestion, which spoiled people who wanted to run or be timed. The road was closed off, but still commuters weaved in and out, crossing our paths as we ran round. I dislike sitting on bench very much, so i truely hope it isn’t something major and will allow me to continue training.